VoIP (Voice over Internet Protocol) is simply the biggest revolution in phone technology since cellular, and poised to eclipse it. By routing phone calls over broadband Internet connections, VoIP bypasses traditional phone service and delivers practically free long-distance calling around the world. If you aren’t using VoIP yet, you should be. Or you may be using it, and just not know it. Almost all voice chat services, like Skype and GoogleTalk, use some form of VoIP. Now, Wi-Fi/WIMAX is enabling VoIP to move out of the home and office, pitting it squarely against cellular service. Cellular providers have seen the writing on the wall, and are now starting to offer their own hybrid cell/Wi-Fi services that take advantage of the strengths of each. Wi-Fi-based VoIP calling is the most efficient solution in homes, offices and public hotspots where broadband provides reliable and inexpensive connections. Cellular works best in the field, where Wi-Fi may not be available. It’s expected that all major carriers will offer hybrid service in the near future, T-Mobile is the first, with its Hotspot@Home offering. 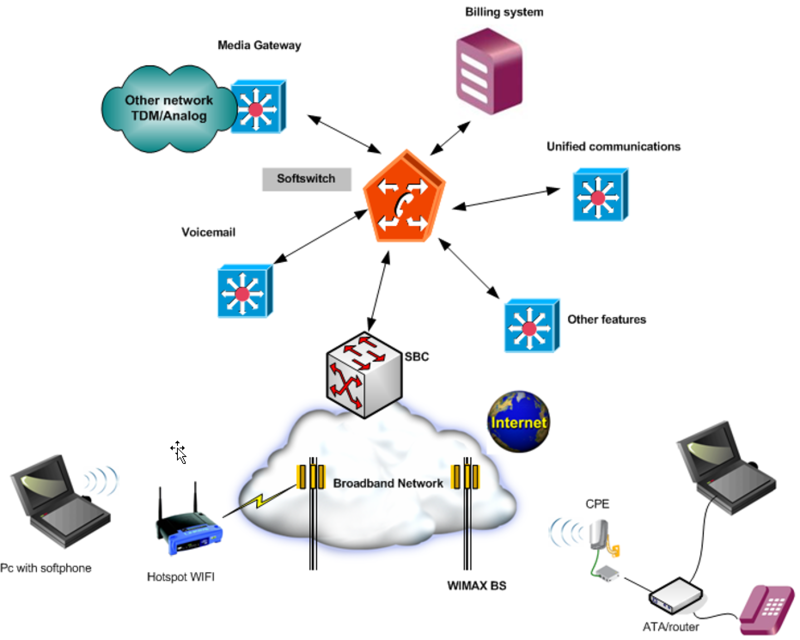 This document describes a complete Voice over IP solution for the Internet Service Provider business telephony. Traditional Calling Card services – EIC can be configured to provide standard calling card services via traditional “dial through”, with PIN or CID authentication. Callback services, EIC supports a number of call-back methods including ANI, DID and web based call-backs. VoIP residential services – Customers can be issued with a softphone or hard phone and be billed for calls made via Voice over IP. VoIP wholesale termination – EIC can be used as a softswitch to terminate and bill large numbers of VoIP minutes from a number of sources such as resellers and distributors of your services. VoIP termination – With the growth of IP based PBX systems , EIC can be used to provide services and billing to IP PBX resellers and Asterisk system integrators. DID termination and redirection. DID can be redirected to any SIP, IAX or PSTN destination with monthly charges and duration based charges. The EIC Platform has been deployed in a number of commercial environments by both traditional TDM based telecoms companies wishing to move into the VoIP market, and calling card and call-shop businesses. Additionally, there has been a lot of interest from IT and networking companies who are beginning to deploy VoIP PBXs in addition to their traditional business, and wish to enjoy an ongoing income by terminating their customer’s calls using EIC as their Wholesale Billing Platform. Flexible IVR configurable by a Web Interface. Extension Batch Tool to create large numbers of extensions using CSV files. Phone provisioner, configurable via a Web Interface. Allows configuration of a large number of IP phones in a short time for supported phones. Hardware detection interface allowing quick & easy setup of a range of popular telephony hardware. Operator panel. Monitor PBX activity via a graphical interface and perform call transfers and parkings by a simple drag-n-drop. * Call parking allowing calls to be picked up at any extension. The EIC Billing Platform is now a fully featured telecom platform providing converged services, with self contained billing, reporting and statistics for IP and TDM based voice networks and can be configured to supply a wide range of services, rate calls, prepare and send out invoices, as well as accept payments via a number of payment service providers. Top-up account via IVR menu. 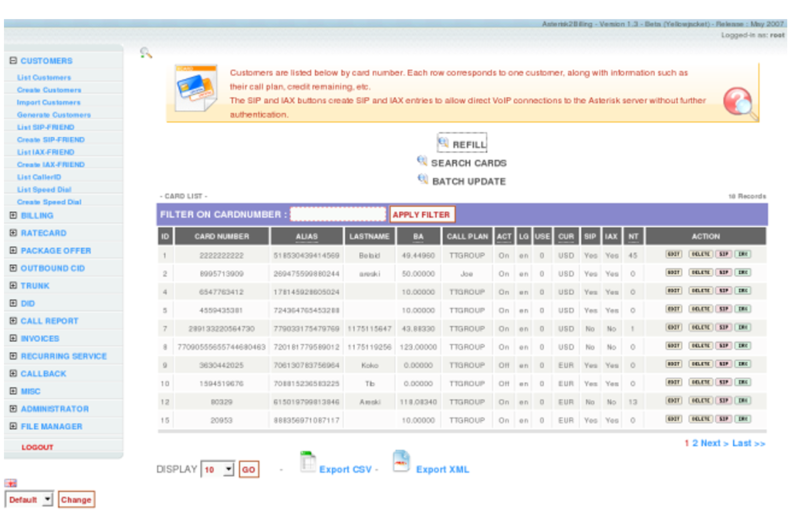 Advanced Card and Customer management : Creation ; Edit ; Search engine ; batch update ; CallerID handling ; Refill Cards. Manage your DIDs and sell them to your customer for monthly usage. Customer can reserve DIDs for themselves and configure a Follow-me to redirect the calls over the PSTN by VoIP. Call-back triggered through multiple asterisk servers. Online signup, selection of tariff, language and currency with email verification. Voucher usage and voucher entry. Can be integrated with the WinprintHylafax plugin. This applications allows to print any document to a virtual fax from a Windows application.